Was the Big 3 Bailout Worth It? The U.S. government’s $80.7 billion bailout of the auto industry lasted from December 2008 to December 2014. The U.S. Department of the Treasury used funds from the Troubled Asset Relief Program. In the end, taxpayers lost $10.2 billion. The Big Three automakers asked Congress for help similar to the bank bailout. They warned that General Motors Company and Chrysler LLC faced bankruptcy and the loss of 1 million jobs. The Ford Motor Company didn't need the funds since it had already cut costs. But it asked to be included so it wouldn't suffer by competing with subsidized companies. The Treasury Department lent money and bought stock ownership in GM and Chrysler. It provided incentives to spur new car purchases. In effect, the government nationalized GM and Chrysler just as it did Fannie Mae, Freddie Mac, and the American International Group. Here's the bailout breakdown. It shows what the government invested. It then shows what Treasury sold the shares for, including what it received in its debt repayment. It then calculates the taxpayer’s profit or loss. Ford Credit received its bailout from the Term Asset-Backed Securities Loan Facility, not TARP. That was a government program for auto, student, and other consumer loans. The federal government took over GM and Chrysler in March 2009. It fired GM CEO Rick Wagoner and required Chrysler to merge with Italy's Fiat S.p.A. The Obama administration used the take-over to set new auto efficiency standards. That improved air quality and forced U.S. automakers to be more competitive against Japanese and German firms. Chrysler entered bankruptcy on April 3, 2009. GM followed on June 1. By the end of July, they emerged from bankruptcy reorganization. GM became two separate companies and spun off GMAC into Allied Financial. Chrysler became a brand owned mostly by Fiat. The Treasury Department began selling off its ownership of GM in 2010. Chrysler paid off the last of its loans by 2011. On December 18, 2014, the Treasury Department ended the bailout. That's when it sold its last remaining shares of Ally Financial, formerly known as General Motors Acceptance Corporation. It had bought them for $17.2 billion to infuse cash into the failing GM subsidiary. The Treasury Department sold the shares for $19.6 billion, making a $2.4 billion profit for taxpayers. On November 18, 2008, auto execs flew to Washington to plead for an additional $25 billion in TARP funds. Congress had already agreed to lend $25 billion from a program to develop energy efficient vehicles. Congress refused the automakers' request. Senate Majority Leader Harry Reid said the Big Three should return with "... a responsible plan that gives us a realistic chance to get the needed votes." It didn't help the public's opinion of the automakers that the three CEOs flew to DC in corporate jets. Opponents said GM and Chrysler brought their near-bankruptcy on themselves. They didn't retool for an energy efficient era. They should have cut production, jobs, and dealerships years earlier. Columnist David Brooks said, "...if these companies are not allowed to go bankrupt now, they never will be." On December 3, 2008, the automakers returned with a larger request. They needed $34 billion: $18 billion for GM, $7 billion for Chrysler, and $9 billion for Ford. This time, Ford's CEO drove to DC. Congress explored whether a planned bankruptcy reorganization without a bailout was a better alternative. It soon realized that would take too long to implement. On December 19, 2008, President Bush agreed to a $24.9 billion bailout using TARP: $13.4 billion for GM, $5.5 billion for Chrysler, and $5 billion for GMAC. In response, the companies promised to fast-track development of energy-efficient vehicles and consolidate operations. GM and Ford agreed to streamline the number of brands they produced. The United Automobile Workers union agreed to accept delayed contributions to a health trust fund for retirees. It also agreed to reduce payments to laid-off workers. The three CEOs agreed to work for $1 a year and sell their corporate jets. On March 19, 2009, the Treasury Secretary Hank Paulson also approved $5 billion in loans to auto suppliers. In 1953, former General Motors President Charles Wilson said, "What's good for our country was good for General Motors, and vice versa." GM sales hit a peak of 17.296 million vehicles in September 2005. But, as gas prices soared, GM's sales plummeted. By 2007, Americans found Wilson’s statement was no longer true. That's the year Toyota beat GM to become the world’s leading automaker. It did so by meeting global demand for smaller cars. While Toyota was building plants in the United States, GM was closing them. Instead of changing, GM offered zero percent financing to sell SUVs and other large vehicles. It was able to do this through its lending arm, General Motors Acceptance Corporation. It was formed in 1919 to provide loans to General Motors' auto purchases. It expanded to include insurance, online banking, mortgage operations, and commercial finance. Its mortgage operations were full of toxic debt. As a result, title insurer Old Republic announced it would stop insuring GMAC's mortgages. The initial $18.4 billion bailout was not enough. In April, GM borrowed another $2 billion. On May 2, 2009, GM stock fell below $1 a share for the first time since the Great Depression. That forced it to require another $4.4 billion to stay afloat. On June 1, 2009, GM entered bankruptcy. It had $82 billion in assets and $172.8 billion in liabilities. That month, sales hit their low point of 9.545 million cars and trucks. The government lent GM $30.1 billion to fund operations through June and July while it went through bankruptcy reorganization. It also guaranteed GM's extended warranties. In return, it bought 60 percent of the company in warrants for common stock and preferred stock. The Canadian government bought 12 percent. A union health trust received 17.5 percent stock ownership. That was in lieu of the $20 billion needed to cover benefits for 650,000 retirees. Bondholders received 10 percent stock ownership in lieu of $27 billion in bonds. Stockholders lost all their investment. GM promised to repay the $30 billion loan by 2012 when it planned to break even. The company pledged to cut its debt by $30 billion by converting debt ownership for equity. It agreed to pay union health care benefits to retirees by 2010. It promised to sell its Saab, Saturn, and Hummer divisions, reducing the number of models for sale to 40. It shut down 11 factories, closed 40 percent of its 6,000 dealerships, and cut more than 20,000 jobs. The government backed all new car warranties. The economic stimulus bill allowed new car buyers to deduct all car sales and excise taxes. Congress approved TARP-funded subsidies of zero percent financing for some Chrysler vehicles. The government intended to make GM more efficient. That would allow it to become profitable when sales returned to 10 million vehicles a year. That happened in July 2009, when sales hit 10.758 million. GM emerged from bankruptcy on July 10, 2009, as two separate companies. Old GM held most of the debt. New GM held the assets, $17 billion in debt, the contract with unions, and its underfunded pension funds. This allowed it to move forward as a profitable company. The new company only has four brands: Chevrolet, Cadillac, GMC, and Buick. The company sold Saab and discontinued Saturn and Hummer. In April 2010, New GM repaid its $6.7 billion TARP loan. In November 2010, Treasury revealed it would sell half its ownership of GM. That sale allowed an initial public offering on the stock market of $33 a share. It had already gotten back $37.2 billion by selling its ownership in GM. In November 2013, the Treasury Department announced it would sell its remaining 31.1 million shares in GM. In December 2014, Treasury sold its remaining shares in Ally Financial. On January 16, 2009, the Treasury Department approved a $1.5 billion loan for Chrysler Financial. The interest rate for the loans was one point above Libor. In return, Chrysler Financial promised to pay the government $75 million in notes and reduce executive bonuses by 40 percent. As a result, car buyers got zero percent financing for five years on some models. Chrysler received $4 billion of the $7 billion bridge loan it originally requested. In return, its owner Cerberus vowed to convert its debt to equity. Chrysler had also asked for $6 billion from the Energy Department to retool for more energy efficient vehicles. Chrysler wanted the Big Three to partner with the federal government in a joint venture to develop alternative energy vehicles. That didn't happen, and Chrysler didn’t get the loan from the Energy Department. Instead, it pledged to debut an electric vehicle in 2010 and ramp up its production to 500,000 by 2013. On April 30, 2009, Chrysler filed for bankruptcy. Treasury Secretary Tim Geithner agreed to lend it $6 billion to fund operations while in bankruptcy. It emerged as a new company, 58.5 percent of which automaker Fiat S.p.A. of Italy now partly owned. This Fiat-Chrysler merger created the world's sixth largest automaker. The rest is owned by the United Auto Workers Retiree Medical Benefits Trust. Chrysler closed underperforming dealerships as part of its bankruptcy proceedings. In May 2011, Chrysler repaid $11.2 billion of its outstanding $12.5 billion in TARP loans six years ahead of schedule. Total cost to taxpayers was $1.3 billion. In 2013, Fiat CEO Sergio Marchionne announced plans to take Chrysler public on the New York Stock Exchange. This allowed Fiat to purchase the rest of the company and merge the two into a more competitive global automaker. In October 2014, it was listed under the ticker symbol "FCAU." The new company was called Fiat Chrysler Auto Company N.V. Its 2017 market capitalization was $17 billion. In 2016, Chrysler spun off its Ferrari division. In 2017, there were rumors that Chrysler might sell its flagship Jeep brand to a Chinese automaker. The company also switched its U.S. plants from cars to trucks and Jeep sport utility vehicles. There are no plans to build electric or self-driving vehicles. Although Ford did not receive TARP funds, it did receive government loans. These were critical because banks were not lending during the financial crisis. It requested a $9 billion line-of-credit from the government. In return, it pledged to spend $14 billion on new technologies. On June 23, 2009, Ford received a $5.9 billion loan from the Energy Department's Advanced Technology Vehicles Manufacturing program. In return, it pledged to accelerate development of both hybrid and battery-powered vehicles, close dealerships, and sell Volvo. It upgraded factories in Illinois, Kentucky, Michigan, Missouri, and Ohio to produce hybrid vehicles. Ford used the funds to switch its focus to commercial electric vehicles. In 2016, CEO Mark Fields said, "We want to become a top player in electrified solutions. The company wants to lead…we can win such as with our commercial vehicles." Eighty-one percent of the funds went to create new efficiency technologies for gas-powered vehicles. For example, they helped fund Ford's aluminum bodies in the F-series pickups. The Congressional Research Service estimated the loans saved 33,000 jobs. Ford will repay this loan by 2022. Many argue that Ford needed the funds to sustain its cash flow during the recession. Ford says it was in better shape than the other two because it had mortgaged its assets in 2006 to raise $23.6 billion. It used the loans to retool its product lineup to focus on smaller, energy efficient vehicles. It got the United Automobile Workers to agree it could finance half of a new retiree health care trust with company stock. By April 2009, it retired $9.9 billion of the debt it had taken out in 2006. By December 2008, auto sales had fallen 37 percent in a year. That was 400,000 fewer vehicles or the equivalent of two factories' annual output. GM and Chrysler had the worst decline, while Ford's loss was about the same as industry leaders Honda and Toyota. 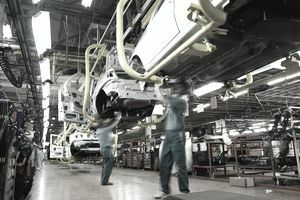 At the time of the bailout, the auto industry contributed 3.6 percent, or $500 billion, to U.S. gross domestic product. A 30 percent decline in auto sales translated directly into a 1 percent decrease in economic output. Many in Congress accused the automakers of not operating competitively for years. The companies had delayed making alternative energy vehicles. Instead, they focused on reaping the profits from gas-guzzling SUVs and Hummers. When sales declined in 2006, they launched zero-percent financing plans to lure buyers. Union members were paid $70 per hour, on average, while new hires made $26 per hour. GM had twice as many brands as needed. It also had twice as many dealerships, thanks to state franchise regulations. The bailout helped create 341,000 additional jobs. Automobile and parts manufacturing employed 1.091 million workers at its April 2006 peak. By June 2009, that number had plummeted 43 percent to 624,000 workers. Dealerships laid off 16 percent of their workforce. Dealership employees fell from a peak of 1.926 million in September 2005 to 1.612 million in February 2010. These figures include foreign automakers as well as the Big Three. The main purpose of the bailout was to save jobs at GM. But GM had to slash its employment and production anyway. Toyota and Honda continued to increase their U.S. factories, providing jobs for American auto workers. If there had been no bailout, Ford, Toyota, and Honda would have picked up even more market share. Since they had U.S. plants, they would have increased jobs for Americans once the recession was over. The loss of GM would be like the loss of Pan Am, TWA, and other companies that had a strong American heritage but lost their competitiveness. It would have perhaps tugged at the heartstrings of America but not really hurt the economy. As a result, the auto industry bailout was not critical to the U.S. economy, like the rescue of AIG or the banking system.